West Clear Creek flows along the boundary of this desert canyon country camp and is a popular place for hiking, swimming, wading and fishing. Cool water species such as smallmouth bass and green sunfish populate the stream near the campground. The oasis bordering the creek and extending into the campground is an excellent place for wildlife watching. It provides a productive home to a number of species of colorful songbirds and raptors. Beyond those lush environs, the Sonoran desert bristles with cactus and adds variety to any hike. 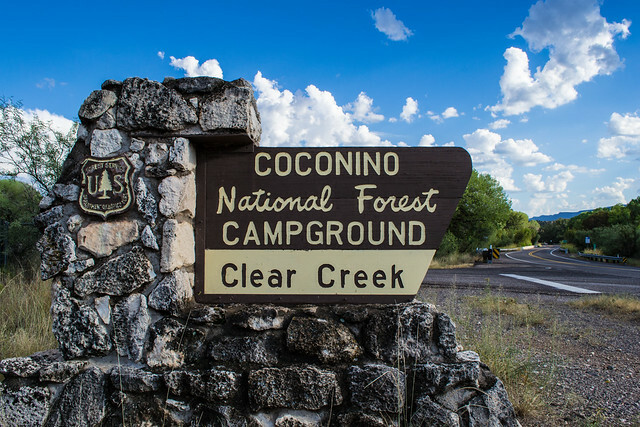 Clear Creek Campground is grassy and flat with shade provided by tall cottonwoods. It has a relaxed and open atmosphere that keeps people coming back year after year. Just a short gravel road separates the campground from nearby paved SR 260. Reservation required for the group site. Visit Recreation.gov or call 877-444-6777. See the Camping and Day Use Reservation Policies on Recreation.gov for information on cancelations, refunds, and other details. Discounts: Senior and Access Interagency passes are accepted for a 50% discount on single-site camping fees. Other Interagency passes are not accepted. No Senior/Access discounts for group camping. Location: 56 miles south of Flagstaff, 6 miles southeast of Camp Verde exit on I-17 in the Verde Valley. Elevation is 3,200 feet. Access: Drive 50 miles south of Flagstaff on Interstate 17 and take any of the three Camp Verde exits. Drive through Camp Verde and continue east about 5 miles on State Highway 260 (the General Crook Highway). Turn north on FR 626 to the campground. No. of Sites 18 single-unit sites. No utility hookups. Reservations are not available for single-unit campsites. Single-unit campsites are first-come, first-serve only. Fire Information Fire rings and cooking grills. No. of Sites One group site accomadating up to 80 people. No utility hookups. For group site reservations, visit Recreation.gov or call 877-444-6777.